The Seven Mile Hole Trail may be the best hike in the Canyon area of Yellowstone National Park, on the north rim of the Yellowstone River gorge, but a 6.5 mile loop on the south rim is almost as good, visiting four contrasting locations; a much more secluded overlook of the canyon (Point Sublime), the very top of Silver Cord Cascade, where a small stream tumbles a thousand feet nearly vertically to the river, a peaceful lake (Ribbon), and the backcountry thermal area of Forest Springs, which has many fascinating mud pots and hot pools. 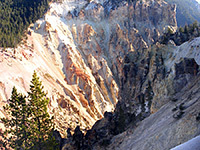 The trail encounters varied terrain of the canyon rim, old growth woodland, meadows and grassy hills, and has only minimal elevation change. The lake and the grassland are good locations to spot wildlife especially bison, and the whole area is very lightly traveled, despite being close to the busy South Rim Drive. Topographic map of the trail. 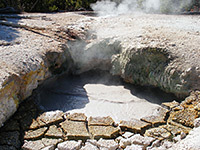 Forest Springs - thermal features (mp4; 2:18 min; 25 mb). The hike starts at the recently enlarged parking area for Artist Point, at the east end of the paved road along the south rim. Most visitors just walk the short path to the overlook, but the Point Sublime Trail branches off eastwards through a patch of trees, past a notice warning casual hikers of the dangers ahead, which include sheer, unfenced drop-offs, as some sections of the path run right along the canyon rim a few feet from the edge of 1,000 foot cliffs. The well used trail bends inwards at one point to cross a gully but otherwise stays beside the rim, and is fairly level, with just a few short climbs and descents, all the while bordered to the south by thick, dark woodland, undamaged by any wildfires. 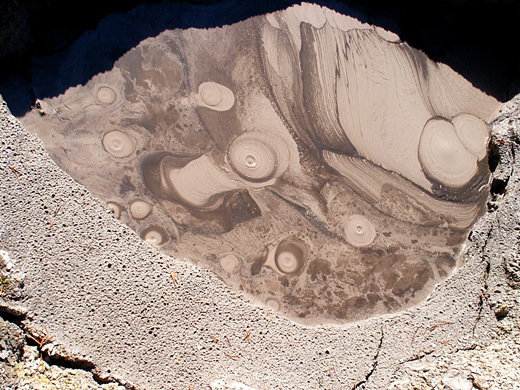 The surface is a little slippery in places owing to dust and loose stones. 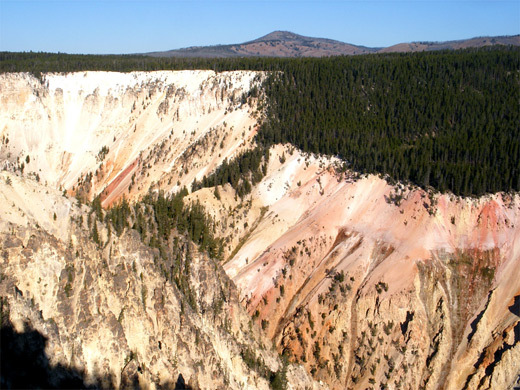 Many small promontories provide good vantage points of the beautiful Yellowstone River canyon - views are centered on Inspiration Point on the north rim, below which the jagged rock walls are completely lacking in any vegetation and colored by volcanic activity in various tints of red, orange, brown and pink. A junction after half a mile marks the start of the route to Ribbon Lake, while the main trail reaches Point Sublime after another 0.7 miles, ending at a small viewpoint enclosed by a low, wooden fence. The views are impressive though not quite as good as might be imagined - several more miles of the downstream canyon can be seen for the first time but this is mostly wooded, so is less spectacular than the colorful upper section (which is not visible from this location). Also, some parts of the scene are obscured by trees, and most is in shadow in the morning - the light is best during mid to late afternoon. 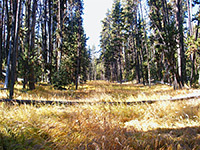 The next location is Ribbon Lake, 2 miles away by trail - back to the junction then through dense woodland whilst climbing gradually - or 0.5 miles cross-country, by walking southeast from Point Sublime, through a thicket of small pines, up the side of a ridge, across the more open ground on top, then over a flattish area with many fallen trees, and down to the trail. Turning left (east), this soon descends a little more, still through deep forest to the edge of a big open expanse; ahead is a small, lily pad-covered pond connected to Ribbon Lake, all surrounded by marshy grassland. 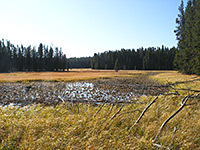 The main part of the lake is a short distance further east, and a spur trail heads that way, passing backcountry campsite 4R1, set in the trees close to the edge of the meadow. The path ends just beyond, next to the lake's exit stream (Surface Creek), a small drainage that flows over the canyon rim to the north, forming Silver Cord Cascade. The falls themselves are not easily visible from the rim, but can just be seen by walking a few hundred feet east, out onto a promontory. 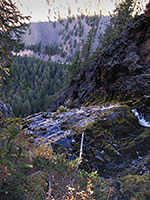 The brink of the cascade may be viewed by carefully climbing down the stream to the edge of the forest, where the waters disappear over a chute of slippery, mossy rocks. On returning to the main path at the edge of Ribbon Lake, the route turns south, staying fairly flat for 0.7 miles through more aged woodland of large, tall pine trees with just a few glimpses of meadows, to a junction with a long path to Wapiti Lake. Near the junction are a shallow, grass-lined pond on one side and a meadow on the other, as the trail descends down a long, gently-sloping ravine and eventually emerges from the forest to a vast grassy plain extending several miles south towards Sour Creek and the Yellowstone River - good bison habitat, and the animals may often be seen grazing nearby, along the edge of the trees. Also next to the path are a few minor hot vents - part of the Forest Springs Group - but the main thermal area is out of sight of the trail behind a thin belt of woodland to the north, scattered over a sizeable region of bare white earth and crossed by a small creek. 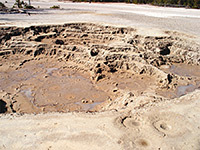 The path reaches the stream a little way below the best section, where the features are mainly mudpots and cloudy pools, some quite large and showing an interesting range of behaviors. 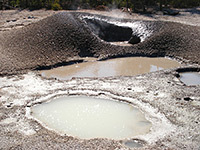 There are also many sulfurous vents and springs, some bubbling fiercely, others emitting only vapor, sometimes lined by bright yellow crystals of deposited sulfur. An hour or two could be spent wandering around here, and looking for other pools in the woods to the northwest. The path however stays away from most of the springs, continuing westwards through patches of trees, around the edge of a hill and back to the grassland, where it arrives at a junction. One way to return to the trailhead is to take the right fork, which soon passes a large, warm, emerald green pool (Clear Lake) and joins the path to Ribbon Lake, from where the Point Sublime Trail is reached by turning left. A quicker route though is to walk due north cross-country, veering slightly east down a grassy ravine and meeting the South Rim Drive; the parking area is then just half a mile east.